Now I'm wondering how long it will be before people start "accidentally tweeting" stuff that they delete and apologize for as soon as the meme has leaked and begun to work its' viral damage. I’ve posted the first of three podcasts in a series on Personal Branding and Social Media. This one is an interview with Brian Flatow, President of the Ad Store. I’ve known Brian a long time and it was great to get the opportunity to get to sit down and hear his thoughts on how to use Twitter, the other social media tools and how it can help/hurt personal brand. Posted a new IT&T SIG video podcast – one of the best yet. This is an interview that was shot in Amsterdam at the PMI Congress with Björn Granvik from Jayway. The Swedes in PMI are, as a rule, pretty awesome folk and sharp as hell. In the interview we talk about Jayway, Øredev (one of the best conferences I’ve ever been to because of the diversity present) and Scrum. The twist on Scrum in this podcast is that Björn tells the story of how he started using Scrum in his marriage, making his wife the Product Owner. Pretty soon, the kids took to it as well and began assigning themselves tasks so that their Dad would get to the stuff they wanted to do. It’s a great story. You can access the video on the IT&T SIG website which also has a link to iTunes where you can subscribe to the podcast if you like. I’ve still got a lot from Amsterdam, Portugal and some of the branding and social media stuff I’ve been working on, so I’m trying to put up one a week. I’ve been quiet, well, not quiet. I’ve been (re)learning some lessons about over commitment. Not out of the woods yet, but close enough that I can hear the cars out there on the highway waiting to run me down when I break through the trees. The research on PM Mashups has proven to be really interesting. Maybe it is an indicator that the meme hasn’t fully reached the PM world yet, maybe people in this profession need to waste more hours surfing You Tube or watching Towers Under Fire (which makes so much more sense to me now that it did when I rented it from TLA back in college.) In general though, what I’ve found is that there are folks who do mashup techniques and tools from outside PM, but they don’t think of it as a mashup. There are others who have completely different ideas about what a PM Mashup would be. Either way, the paper for PMI Congress is done and I’m really looking forward to giving the presentation and, more importantly, hearing what the folks who attend have to share about how they are mashing it up. The best part about the research for this paper was that it led me back to an idea that had been stuck in my head since the Scrum Gathering in Orlando. The idea of Personal Branding and how people in PM or IT use it (or not) and what impact it can have on their world. I got kinda deep into it and was sidetracked from the mashup idea for a few weeks. (Nothing like creating a new project when you already have stuff spilling off the plate.) But now, I’m back at it and this is my new topic. I’m going to put together an article on it, I’ll be posting here in the blog and I’ve already got a few video interviews to post. What I’ve found so far though is that personal brand is an idea that PMs in general should probably spend a lot more time thinking about it than they do. I still believe that trust and transparency are the currency of PM, but personal branding seems to be that missing piece that can be used to tie some of the other pieces that lay out there, impacting us, but we don’t think about, or just generally aren’t aware of. I have a few hours of video to edit still from Poland and Amsterdam – I’m going to have it all posted within the next few days. Once it is up, the Personal Branding of Project Managers will be the main focus of this blog. So, if you are reading this, and you are working in IT or PM, and you actually spend time thinking about and working on Personal Branding, please let me know. I’m hoping to spend awhile on this topic. I've posted the video interview that Luis Garcia did with Bas De Baar, the Projectshrink, while were in Amsterdam for the 2009 PMI EMEA Global Congress. Lots more to come from Amsterdam still, plus I have a bunch from the PMI Portugal Chapter event. The Certified Scrum Master for Project Managers course is online for registration. The course is being built by Stacia Broderick, Michele Sliger, Mitch Lacey, Jesse Fewell and I. So if you know any one who is a PM and wants to become a Scrum Master, this course is specifically designed to help experienced PMs get their CSM and understand how a seasoned PM can incorporate that into their toolset. After the kickoff, Rachel Hammer, the EMEA Component Relations Liaison from the PMI EMEA Service Center gave a presentation on PMI in the EMEA Region and I followed up with a presentation that centered around the idea that if our profession is going to continue to grow and evolve, we (the PMs) are the ones who need to start having at developing new tools and paradigms in order to get us into a new stage of maturity for our profession. After that, they transitioned over to Portuguese. Sadly,my ability to understand Portuguese is about on par with my ability to understand the game of cricket. However, what was related to me about the presentation that was given by Eng. Julio Moreno from HP Portugal made me quite jealous of the others in the room who are not as language challenged as I. For the Agile minded, I mentioned it a few times in my presentation and a number of people came up to talk about it further after the session. Which gave me a great opportunity to promote the new Scrum Master for PMPs class that is being developed by the Scrum Alliance, and which I will be writing on in great length later this weekend. One person in particular had questions about using Lean with, or alongside a traditional PMBOK based approach, if anyone who reads this can comment on that, it would be greatly appreciated. Where's My New New Thing? Am I missing anything? It seems like we're due for a new model. 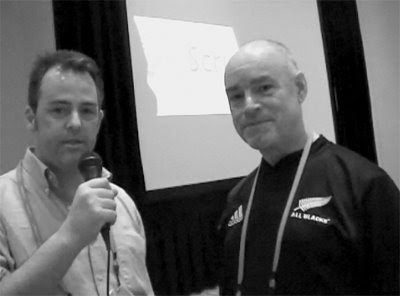 I’ve started posting the video interviews from the 2009 Scrum Gathering in Orlando. You can watch PMI Agile Forum’s Jesse Fewell interview Ansley Nies about the Open Space she ran at the Gathering, see an interview with Alistair Cockburn (founder of Crystal and one of the original authors of the Agile Manifesto) and an interview with AgileThinking’s Tobias Mayer. If you’ve not been following the story, leading up to the Gathering Tobias was pretty critical of PMI being involved. The video interview was shot not long after PMI CEO Greg Balestrero’s Keynote speech and a separate conversation between Greg and Tobias shortly afterward. You can also read up on it in the AgileThinking blog and in Greg Balestrero’s PMI blog. More videos will be posted in the coming days…. Day 3 of the Gathering started out with the follow up to Open Space. Around the room, participants shared their impressions of the Open Space and the gathering as a whole. There were a number of people who spoke up as being supportive of, or cautiously optimistic towards the PMI presence. When PMI Agile Forum leader, Jesse Fewell gave his presentation exploring the differences between Scrum Masters and Project Managers, people were spilling into the hall. And this time, the attendees extended beyond the small cadre of folks who attended the Day 2 sessions and included folks like Jeff McKenna and Tobias Mayer. It was a lively discussion and raised a number of interesting ideas that seemed to center around the role of the PM/Scrum Master as an agent of change who is there to transform an organization, and enable them to become more “healthy”. If the PM/Scrum Master is to play that role, what is the best way to go about it? The session definitely helped bring to light the fact a lot of people are trying to figure out how to make sense of the whole idea of PMI and Scrum co-existing and how that impacts the person who is responsible for “leading” the effort. Once the panel was over we had a chance to do some video interviews that will be showing up in video podcasts very soon. From the moment I arrived I felt challenged by the people I got to speak with and the ideas that were shared. It was my second Scrum Gathering and I find that it truly is a very organic moment of really sharp people who aren’t afraid to push each other. The only real complaint I heard the whole time was from one attendee who just wanted to be pushed even harder than he had been. In a week or so I will have the video podcasts edited and posted. Until then, I want to say thank you to Greg Balestrero, Mark Langley, the IS SIG, the IT&T SIG, the steering committee of the PMI Agile Forum. We did well. People seem to be thinking it is okay to talk about PMI in the context of the Scrum Gathering. It may not entirely make sense yet, but the message that it was okay to try and figure it out was clearly heard. I also want to thank the folks from the Scrum Alliance – especially Ken Schwaber, Mike Cohn, Jeff Sutherland, Jim Cundiff, Jodi Gibson and Stacia Broderick. I hope that we will be able to return the support and hospitality shown to the PMI community over the past few days. I’m not sure how I am going to dry out from my recently developed Twitter addiction, but I will probably have to keep posting messages to @msliger, @mcottmeyer and @jessefewell until I can shake it off. Day 2 at the Scrum Gathering is about Open Space. If you’ve not been to one before, it is a very organic experience. There are very few rules, but one of them is that the attendees propose topics at the start of the day. Jesse Fewell and I both stood up to propose topics. Jesse held a session for all the folks interested in PMIAgile and I held one that was intended to be a place where anyone who had issues or concerns with PMI attending the Scrum Gathering could come and talk about their issues with it. My hope was to capture the concerns and take them back to PMI. There was a good turnout in the room and it was a very lively debate about the different ideas/concerns around the topic. These will all be posted to the wiki on the Scrum Alliance site as soon as I get home, but there were a few things that struck me today around the whole PMI and Scrum Alliance topic. The first thing I noticed was that people keep getting hung up on the language issues and concerns about how to map which process to what in the other. This presents a significant hurdle for a lot of folks. “If I do X in your process what is that represented in my process?” The problem with this is that the real issue is not a semantic one, or a mapping one. The real problem is the fact that there is no focus on intent for the people in this conflict. Both approaches want to solve the project as quickly and efficiently as possible. There are different ways, but sadly, a lot of people are too busy making sure they are firmly planted in one camp or the other to understand that it really just does not matter because it is about doing the work. Having typed all this, I should confess that I do have one concern coming out of day 2. 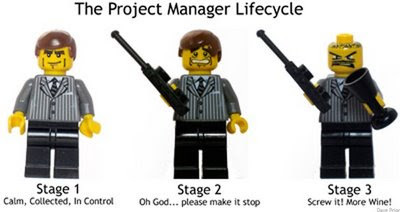 I have had discussions with a number of folks about the role of a project manager in Scrum, or the role of a Scrum Master in project management. Each has a pure approach and for me, in what I do, I blend them together whenever and however I need to in order to get the work done. I do not feel compelled to take up for one side over the other and I don’t believe either is better than the other. I think it depends entirely on the people doing it. Two concerns here: 1) Most people are too caught up in semantics to worry about the intent to deliver and 2) How much of a threat is my approach to the purists? There are a lot of people worried about how PMI might impact the Agile space. There isn’t really anything in place to prevent something bad from happening beyond the people involved. Anyway, I had some great conversations today, especially with Tobias Mayer, the folks who attended the Scrum Sessions and Michele Sliger. One more day. I’m looking forward to getting some interviews tomorrow. It was a very good day and I’ve been twittering under @pmiittelecom for most of it and will do so on Tuesday as well. Jim Coplien and Jeff Sutherland presenting “Not your Grandfather's Architecture: How MVC has evolved into the Agile world”. I walked in a few minutes late… just in time to hear Coplien say that any member of any scrum team should be able to explain the architecture on demand at any time. He said, if you can’t your team is sub-optimal. I think any time you can go to a conference where, within 15 seconds of walking into your first talk, someone has challenged the way you manage your work and look at the world, it is a very good thing. Throughout the morning, there were a number of us twittering about the presentations. This led to a sub-conversation that rode underneath the actual presentations being given. Later, in the halls, we got to talking about whether or not it was rude for us to be typing in session, while people were talking. The general consensus was that it is. But, what if someone is twittering about your presentation? It is, basically promoting you – and giving you free PR. The consensus here, was that if the speaker didn’t know whether or not you were answering email or twittering, then they would perceive it as rude and that is why it is not a good thing (which none of us stopped doing all day). So, I’m wondering if it matters that the driver of good behavior, in this case, may not be the desire to be present and focus on the speaker and engage in their presentation, but simply to not appear rude to them. Last year, I came to the Scrum Gathering as a kind of emissary on behalf of the IT&T SIG. I wanted to see if we could build a bridge between the IT&T SIG and the Scrum Community. Today, Greg Balestrero, the CEO of PMI gave the lunchtime keynote presentation. He did a very good job of engaging the crowd and conveying the message that PMI is an evolving organization that is interested in learning how to work with the Scrum Alliance. The response was very largely positive. People seemed generally hungry for things to move forward. The best part of his talk was the end where he paraphrased a conversation he and Ken Schwaber had held the night before. The basic message they wanted to jointly get across today was to tell everyone in both camps to “stop whining” and that they “have permission to move forward”. From my perspective, this is a very, very good thing. One thing I saw today, that is something I’ve never seen at a PMI conference, was when one of the CST’s left lunch early because he was so worked up about what he’d been running through in his mind that he needed to leave the lunch to go put it down. It is very energizing to be around folks who are genuinely turned on by what they do. The only drag so far was that Michele Sliger and Gabrielle Benefield both spoke at the same time I did. I would have like to have seen both of them present. I’ll be posting more tomorrow and will be shooting some video interviews as well. Thanks. There were two amazing launches this evening. I am quite proud to have witnessed both! I'll be hosting a webinar today with Ken Schwaber, co-founder of Scrum. The webinar will take place at 12 PM Eastern. The work we’ve done so far has been very successful in beginning to build a bridge between the two communities. But now we have even better news! This Spring, at the Scrum Gathering in Orlando, Florida, top thought leaders from the Scrum and Agile community will meet with thought leaders from PMI to discuss ways in which we can continue to develop the relationship and increase the awareness on both sides of the fact that each of the approaches has benefits which can be realized across the others. Space is limited, and the expectation is that it will SELL OUT very soon, so if you are interested, please sign up as soon as possible. I’m just back from MacWorld and ready to get back to work. While I was there I had an opportunity to spend the week helping out in the ProjectWizards booth, showing folks some of the new things that Merlin has to offer. While I spent most of my time in the booth, and didn’t see much of the other exhibitors, there were a few products there, which won awards, that I’ve already been using to help me manage my projects... so I thought I’d focus on them. I’ve written in here before about my continuing efforts to get better at using some version of GTD to manage all my work. There are a lot of products out there. Some of which are really good, some, not so much. Things, which has been receiving a lot of attention lately went to version 1.0 last week and is now able to sync with the desktop client on the Mac. Between the easy interface, the level of detail it lets you get to and the fact that I can now work off of either my desktop or iphone (or ipod touch), it is definitely my app of choice for managing the onslaught of tasks I am still not quite able to get done each day. The last thing I want to mention today, is Merlin. I’m a huge Merlin fan and have been for a number of years. If you use a Mac, and do serious project planning, it is the most robust client available. For me, the line in the sand was the ability to separate work and duration. None of the competing products allow that level of planning. For a while now, the desktop has also allowed you to imbed things like register items and documents (project plans, change requests, etc.) right into the plan, making them available right from the client. It also lets you read and write MS Project files. But Merlin is making another huge leap with the ability to share to the web and iPhone (or iPod Touch) that allows a real time update back to the client or server version of the project plan. This means I can serve my project file from the desktop or server and have my Windows and Linux users update their tasks from the browser window and I can see updates the moment they make them. There is no check in process - it feeds directly in over the internet. With the iPhone (or iPod Touch) I can not only look at my Gantt Chart on the device, but I can make the same updates and they push across the internet back into my plan in real time. I can even view the documents I’ve embeded into my project schedule on the iPhone (or iPod Touch) if the file type is one the device can read (like PDF). It has been a few years since I’ve looked at trying to get Project Server implemented anywhere, but the last time I checked, the cost to get it set up for testing in an enterprise environment was upwards of $100K (US). With the new Merlin capabilities, I can get all that set up and running, including the cost of a new machine (it will run on anything that has 1 GB of RAM and can run 10.4.9 or higher) for under $2K (US). 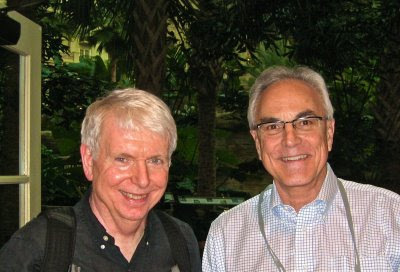 A few weeks ago I was at P2P in Cairo, speaking with Philip Diab, the 2008 Chair of PMI. We were both about to give brief speeches at a conference and he brought up the idea of developing a consistent theme and using it as a sort of guiding idea when preparing for presentations over a period of time. It was great advice, and I have decided that I am going to start off by applying it to the blog. In Lawrence Lessig's new book "Remix", he devotes a fair amount of time early on, to explaining how kids today are creating mashups with music and he goes on to detail what the legal ramifications are with this and the book goes on from there. If you like Lessig's work, or are at all into reading up on copyright law and intellectual property rights, I highly recommend it. While I was reading it, I found that I kept drifting back to the idea of mashups and other places that they occur in modern life. The basic premise is that you take two existing things and push them together to create something new and (ideally) better. The site Mashuptown.com has a great video explanation of it in the upper right corner of their homepage. Depending on your taste in music, this could be a good or a bad thing. But, in coming back to it, I started to think more about the other places in my life that this takes place - especially work. So, jumping back to the whole consistent theme thing... for 2009 my focus is going to be on PM Mashups, or, bringing different (pm related or not) ideas and practices, etc., together in one's approach to project management with the end goal of coming up with a more cohesive, adaptive and ideally, creative way of managing work. My plan is to develop a series on the idea and hopefully, I'll be able to find a bunch of folks along the way who are also mixing their chocolate and peanut butter and don't mind talking about it. For about 18 months I have been primarily using Scrum to manage my projects. For most of what I do, it works very well. It's adaptive, lightweight, and is great for developing trust with the clients. However, I have found that it for it to work best, I need to add some components from other approaches. So now, when I'm working on Scrum projects, I generally try to make sure we have a wiki set up so that we can provide the client with documentation that will be current by the time we leave and which they will hopefully maintain as a living, organic version of the requirements doc. Now, I know that the requirements doc should be created up front, but the simple fact is that most of the time, what is being asked for initially, is not entirely definable and will probably change during development. I also know that once we create the initial requirements that I, as the PM am responsible for keeping it current. Unfortunately, in practice, what I've found is that the requirements doc becomes something that is either A) gathering dust the moment it leaves the printer or B) something I work furiously on updating so that it can gather dust the moment it leaves the printer. My goal is to have a place to capture whatever we initially know in an informal, plain language manner and then build on it as we move forward. We usually start out by entering whatever use cases we have and we work with the product owner until they reach a level of comfort entering directly into the wiki themselves. Over the development cycle, the use cases are updated by the team as they evolve into a sort of post development explanation of what is in place. We evolve, with the product owner, from the initial need, to the realized product, which is documented in plain, simple language. It is not traditional requirements and may lack a lot of the structure that a traditional requirements doc includes, but if the objective of the traditional requirements doc is to define what is requested to a level of detail that can be executed and litigated against, then the wiki reqs, or Requirements 2.0 is intended to be easily digested by humans who may have a need for the information. This mashup doesn't fit perfectly into Scrum or a PMBOK type approach. But, it does enable the workflow process and meets the informational needs of the client in a way that does not place an undue burden on the team. I'll post more in about a week, but if you have any mashups of your own, I'd love to hear about them.